I am going to try to track how some of the unusual tropical / semi tropical plants are doing here over the next year or two. I set up a little knowledgebase to that end. Regardless everyone should plant a few veggies this season! Talk to your local knowledgeable garden center staff. Recently upgraded my hotub to automatic chlorine generation. Good stuff! https://alexa.design/2oS5TnW If you have bought from the company that makes them before you can get a 20% discount if you order from them direct. 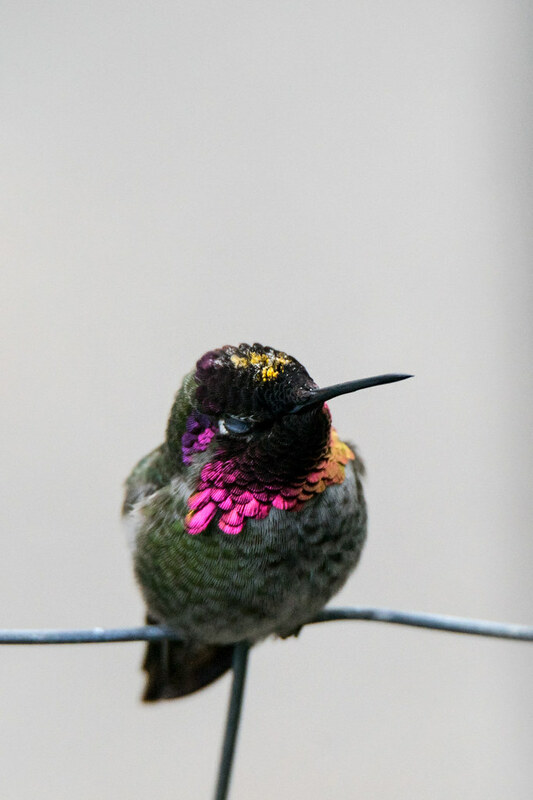 Sony A7II + LA-EA3 + Tamron 150-600 A mount and a helpful hummingbird in overcast late afternoon light, handheld. Down hats, they are toasty warm, ball up into a tiny package, and weigh little! But which to get?! Blackrockgear.com makes what appears to be the top of the line hats, but at $70- $90 dollars I was not able to get one. The are .75 – 1 oz in weight, look good, have very high quality down in them, made in the US. But couldn’t justify the cost. The Outdoor Research hat is supposed to be just over 1 oz, but I did not weigh it myself as I didn’t want to take the tags off given fit issues. The large was too big for me, pulled down all the way it covered my eyes as well as my ears. The elastic they use on the back quarter is thin and can bother people based on amazon reviews, but in my brief testing it wasn’t an issue for me. I could have still used it, just pushed up a bit, but there would have been space at the top which seemed kind of a waste and gives it kind of an odd look. The Columbia is about 2oz and is the heaviest of the bunch, the interior has a sweat wicking band and one of the 4 panels bottom edge is elastic so it has some wiggle room. The large fit me perfectly with no additional space on top, fully pulled down just completely covers my ears. 800 fill power down and ‘omni-shield’ water resist coating. All sorts of fun photos of Luna’s first couple of months with us!